So, we built systems, tools and software to help organizations of all sizes gain CX insights, create winning CX Strategies and build products customers love. We help unravel the value of CX and have proven experience working with executives to build sustainable winning CX STRATEGY. We help our clients uncover the real PULSE (heart beat) of their customers opening up a gateway for new REVENUE opportunities. We are champions of INNOVATION and mentor our clients on how to build customer influenced products. Great Customer Experience is more than what a customer experiences when they purchase your product. Take our CX Grader to quickly gauge your organizations CX maturity. Do you collect CX data? It is important that you collect and measure data from every part of your business. It is common for organizations to focus all their attention on social media, sales & marketing. The best performing company's with mature Customer Experience Management systems collect data from every part of their business. 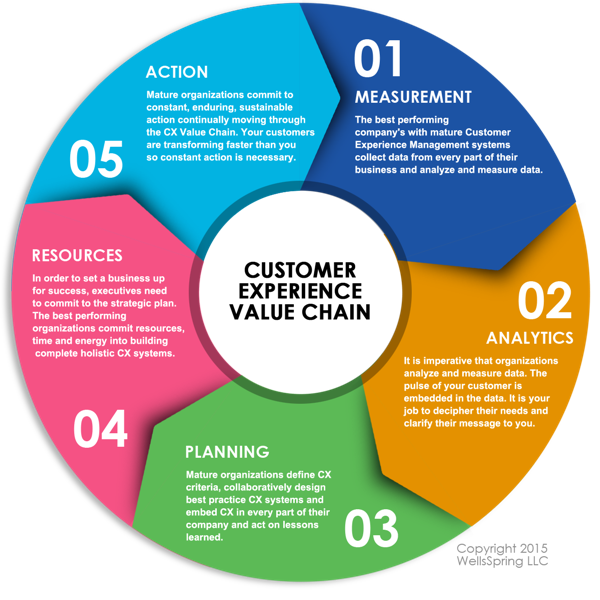 Do you analyze CX data (Measurement)? Analytics is equally as important as collecting and measuring data from every part of your business. It is imperative that organizations analyze and measure data. The pulse of your customer is embedded in the data. It is your job to decipher their needs and clarify their message. Do you act on lessons learned? What you do after you have determined the pulse of your customer and understand the gaps in your CX system is important. 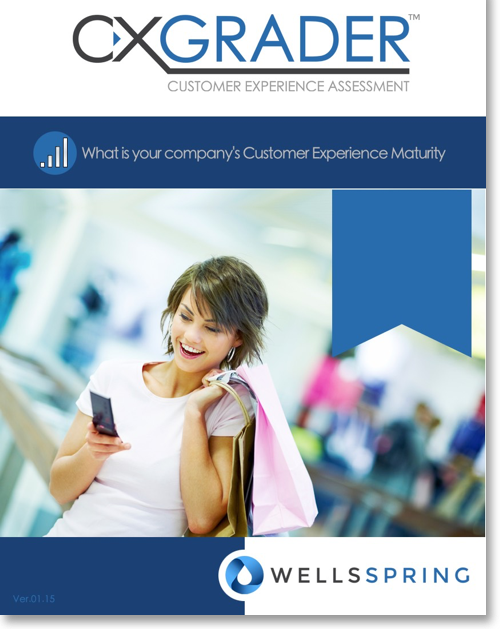 Mature organizations define CX criteria, collaboratively design best practice CX systems and embed CX in every part of their company and act on lessons learned. Customer Experience Forms the Nucleus that Influences Decisions in Every Part of Your Business. Gain Customer Experience Insights and build better products and winning CX Strategies using WELLSSPRING (CX) systems, tools and software. WELLSSPRING has a world-class consulting team that works with business executives to create winning CX strategy and build customer influenced products. We help your business learn about Customer Experience (CX), gain a deeper understanding of your customers utilizing best-of-breed CX insights tools, and create action plans to amaze your customers and dominate your competition. The WELLSSPRING team is comprised of smart, fun (& witty) startup and enterprise executives from multiple industry’s with deep experience in customer focused product development, software development, business process engineering, sales, marketing and human resources. We LOVE what we do! WELLSSPRING founder, Robert W Wells is a Seasoned Silicon Valley entrepreneur & trusted start-up technology executive with a 17+ year successful track record of architecting, building and delivering innovations to market and managing the teams that bring ideas to life. Proficient building and managing technology initiatives and blending customer/user experience, business strategy, process excellence and product development experience into every initiative. Robert started his first business at age 16 and began his career in technology developing interactive websites in college. After college, he joined an eCommerce software firm (dot.com) in Virginia as a web developer and software UI developer. Soon after, he moved to San Francisco, CA to pursue his passion for business development & computer engineering. Along the way, he founded an early stage accelerator and launched 15+ startups and mentored dozens of entrepreneurs. Robert has held roles as CIO, CTO, CEO and Sales Executive and experienced startup acquisitions and exits. Want to talk startups & technology? Robert is a Startup Council Member & Startup Ambassador for Palm Beach Technology Association. Visit the #PalmBeachTech site. Connect with Robert on Social Media.